Besides the Canadian filmmaker who implanted a camera into his eye, someone else in the world is moving ever closer to bionic perfection. Martin Magnusson, a self-professed “researcher and entrepreneur” sought to literally expand his horizons with the help of some tech lying around his house. 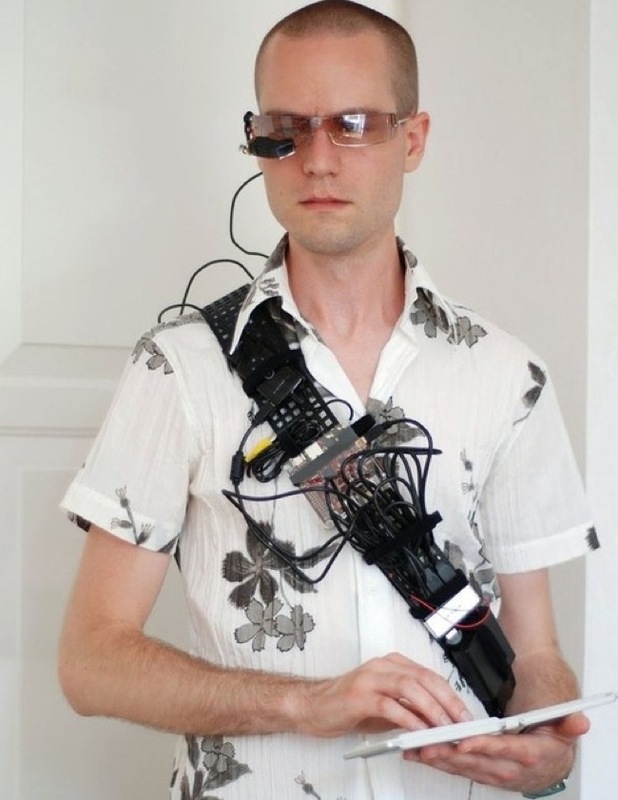 The result: A wearable computer. For portability, Magnusson is using a single Beagleboard computer packed inside a CD case where it shares space with a USB hub and an independent power supply—four 2700 mAh AA batteries. He is able to view his daily ‘to-do list’ thru an attractive pair of Myvu glasses that house a tiny video screen. For additional input and all-important email, Magnusson uses a Nokia keyboard. Internet access is via Bluetooth attached to an iPhone in his pocket. As a concept, Magnusson can pat himself on the back for contributing to that still farfetched goal of turning ourselves into robots. Unfortunately this PC isn’t too sleek design-wise, with poor ergonomics and haphazard wiring that could lead to a serious accident like tipping over a cup of boiling hot coffee onto your lap. But for effort’s sake, it’s certainly a laudable piece of work worthy of Blade Runner itself.